This is Part II of my look at the new Cabinet and LDP leadership line ups, announced this morning and this afternoon. Part I can be found here. CONTINUING Amari has been the most forceful and consistent advocate of all aspects of Abenomics. The point man on Trans Pacific Partnership negotiations, he may be ceding some of the responsibilities to Nishikawa Koya, the Liberal Democratic Party committee chairman on TPP, who is slated to join the cabinet as agricultural minister. Amari fought a successful battle against tongue cancer this year, scarcely taking any time off from his tasks. If he is now at full strength he will be in a position to carry the Abenomics agenda further -- and the economic reform movement needs guidance, at the very least. News of this appointment arose very late and comes as a bit of a surprise, even though Shiozaki is widely seen as one of the politicians Abe relies upon for policy advice. When Shiozaki was left out of the Cabinet after Abe's return to power, many wondered what he had done to be so out of favor. That Shiozaki had been chief cabinet secretary to the most spectacularly failing cabinet in history, at least until Hatoyama Yukio's no doubt contributed to his being left on the sidelines. Shiozaki sudden emergence from obscurity over the last few days has been remarkable, especially in light of reports that Abe was struggling to find spots in his cabinet for the 60+ LDP members of the Diet who have at least 5 House of Representatives elections of 3 House of Councillors elections under their belts without ever having been ministers. These "left behind" (taiki) senior Diet members have been all on their best behavior hoping to win a seat in the next cabinet. Disappointing them carries risks that they will throw their support behind whoever challenges Abe in September's party presidential election. Hayashi Yoshimasa had the temerity to run for the LDP presidency against Abe Shinzo in 2012. For his quixotic and wildly unsuccessful effort, Abe awarded Hayashi the ungainly and ultimately soul crushing MAFF portfolio. 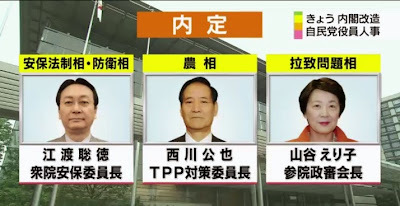 In his leadership of the LDP's committee in charge of the TPP, Nishikawa has been a thorn in the side of the government, or at least has made an insufficient effort to push the government's line within the party. For his efforts, Abe will be awarding him the MAFF portfolio. Eto has been Senior Vice Minister of Defense three times. He is more than ready to grasp the brass ring of MOD. However, with Ishiba Shigeru's refusal to accept the post of state minister in charge of legislation supporting the Cabinet Decision on collective self defense, Eto will be discharging the responsibilities of what until a few days ago were considered two full-time ministerial positions. Matsushita is a cheerleader for the LDP. Really. She started the baton-twirling club at Tokyo University, where she majored in economics. She is the chairman of the national baton twirling association (She also has, and I am not making this up, a Level II certification as a Rajio Taiso Instructor). She was an economics and politics journalist for the currently beleaguered The Asahi Shimbun (read this article for the Asahi's latest stumble) for 15 years before turning to politics. Why is Matsushita the right person for this post? Law used to be where the PM would stick the oldest, most decrepit member of the Cabinet. 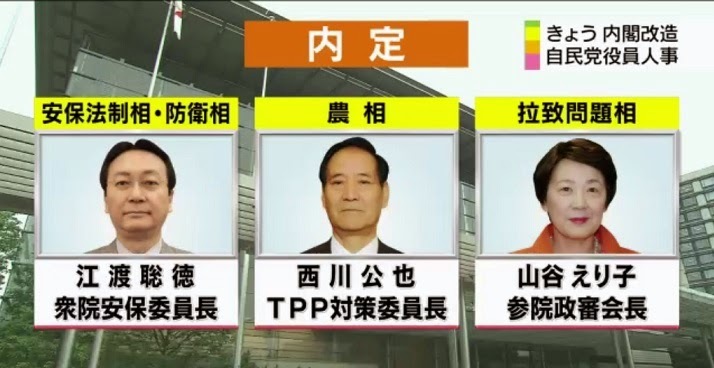 Now, with Hatoyama Yukio Kunio and Tanigaki Sadakazu as recent alumni (the holders of the #1 and #2 spots in the ranking of the number of executions ordered since the electoral reforms of 1993) Law now seems the factional/gender/elections balance posting. Mochizuki's is an odd case. He has 6 elections to the Diet but has already had two stints as a cabinet minister, both times as minister of MLIT. Mochizuki was also a parliamentary secretary of the environment over a decade ago and has been associated with the movement to make Mt. Fuji a World Heritage site. In between those two extremes his loyalties lie. Takeshita Wataru is the half-brother of the late prime minister Takeshita Noboru. He is the brother-in-law of Ozawa Ichiro. He serves as representative of what is one one of the most parasitic of the parasitic (i.e., government construction contract dependent) prefectures. Abe is putting Takeshita in charge of the Tohoku's revival from the devastation of the 3/11 triple disaster. Iwate Prefecture, Ozawa's kingdom, is arguably the most affected of the three prefectures most devastated by the disaster. You do the math. Abe clearly did. Yamatani made the flight from Democratic Party of Japan madonna to LDP firebrand poster child so fast almost no one remembers how she got from there to here. She has not been all abductees, all the time (she has an interest in "reforming" education identical to Shimomura Hakubun's) but she has sure made it seem that way. Now she has them all to her very own, just in time for the much anticipated and already behind schedule report from the Democratic People's Republic of Korea on what it knows about hundreds of purported abductees and other Japanese living in North Korea. Her appointment to the leadership of the national police, replicating the work assignment of her predecessor Furuya Keiji, represents a leap of faith on Abe's part. For the LDP's #2 man to take a state minister post is incredibly peculiar, even more than former party president Tanigaki Sadakazu's descending the ladder to replace Ishiba at secretary-general. Clearly neither status nor expertise clearly affected Ishiba's choice to accept this portfolio; he turned down the defense legislation posting, the seemingly natural policy home of a "defense otaku" as he styles himself. Ishiba's service in this newly created post seems a private bet between himself and Abe. Ishiba sees the post as a way of maintaing his popularity and influence in the local LDP chapters (Ishiba defeated Abe in the first round of the 2012 presidential election based on his greater appeal in the local party apparat), maintaining the relationships he fostered during his time as party secretary-general. Abe probably sees the post as a way of entangling Ishiba in the chronic, insoluble problems of the rural areas, making him the scapegoat when the government fails to implement any viable policies - because there really aren't any. We shall which gentleman's bet pays off. This appointment makes more than a modicum of sense. Arimura was earning her second master's degree from Aoyama Gakuin (her first is from SIT, in Vermont) while working full time at McDonald's Japan and then running for a seat in the House of Councillors (before gasping, note the seat was a party list proportional seat). Arimura is a direct lineal descendant of one of the assassins of Ii Naosuke (a rather extreme form of administrative reform) and also a descendant of the Hero of Tsushima, Togo Heihachiro. This grab bag of all kinds of topics hot (including the Cool Japan Initiative) and not used to be Inada Tomomi's bailiwick. The nice thing one can say about Yamaguchi's appointment is that at least this embarrassing collection is not pinned like a brooch on any of the new women members of the cabinet. What kind of Cabinet and LDP secretariat is this? A Cabinet and Secretariat for ruling Japan until the end of the current House of Representatives term in December 2016? A line bright, competent faces for display purposes only prior to a dissolution of the Diet and a snap election? Let us say that one cannot say. The assignments, particularly in terms of factional balance, speak of stability, as does the intake into the Cabinet, Japan's face to the world (however unrepresentatives that face) of 8 newcomers and 5 women. Stability may only last until August 2015. Depending on how the economy is performing and how jagged the passage of the legislation needed to enable the Cabinet Decision on collective self defense, Abe and his core lieutenants might either be loafing out on the golf course or scrambling from one LDP parliamentarian's district and offices to the next, begging dissatisfied or scared members of the Diet for support for Abe's reelection as president of the LDP. What is done, though, is done...and I am done for the day. Later - This one leapt out at met during the newscast listing all of the new ministers's titles and should have leapt out at me earlier: Arimura's main responsibility will be running the Consumer Affairs Agency. She is a former McDonald's Japan management track employee. Beyond perfect. Bravo Mssrs. Abe and Suga. Bravo. Thank you for your illuminating posts, as always. Re 'law' ministers, I think you mean Hatoyama Kunio, not Yukio. Thank your for the compliment and for spotting the error. Yes, I was talking about Kunio. Level 2 Rajiotaisou, damn now I know I'll never make it!